On 9-Oct-2013, the European Commission (EC) approved the acquisition of loss-making Olympic Air by loss-making Aegean Airlines. Although a previously proposed merger of the two was blocked by the Commission in early 2011, its analysis now indicates that Olympic would go broke in the near future if it were not acquired by Aegean. This raises some interesting questions. For example, why did the EC not give fuller consideration to the possibility that new entrants might fill the gap left by Olympic? And why is Aegean paying EUR72 million for a loss-maker that the EC says is “highly unlikely to become profitable in the foreseeable future under any business plan”? The acquisition was agreed with Marfin Investment Group (MIG), Olympic’s current owner, in Oct-2012. It then became the subject of an investigation by the European Competition Commission. Under the recently approved deal, Olympic will become a subsidiary of Aegean and will retain its own brand, fleet and livery. The consideration for the transaction is EUR72 million, of which Aegean has already paid EUR20 million to MIG. Completion of the deal is expected by 18-Oct-2013. The process of integration of support functions has already begun. The in-depth, or Phase II, investigation by the Commission into the effect on competition in the domestic market was opened in Apr-2013. The Greek crisis led to a fall in domestic passenger numbers of 26% from 2009 (6.1 million passengers) to 2012 (4.5 million). The first half of 2013 saw a further 6.3% decline year on year. Olympic is also in decline. At the time of the first proposed deal, Olympic was operating 32 aircraft, including 15 jets. Today it has an operating fleet of only 14 turboprop aircraft and is in the process of giving back its last remaining A319. Moreover, the number of overlap routes between Aegean and Olympic fell from 17 in 2011, of which nine raised competition concerns, to seven currently. According to the EC, five of these seven are duopolies: Athens to Chania, Mytilini, Santorini, Corfu and Kos; the last two of which Aegean operates only in the summer. The investigation focused on these five domestic routes. According to Innovata, the other two overlap routes are Athens to Mykonos, where the two also operate a duopoly, and Athens to Rhodes (but Olympic ceased to compete on the latter route in Sep-2013). The five routes identified by the EC accounted for 950,000 passengers in 2012, compared with four million passengers on the nine overlap routes in 2011. The Commission says that its investigation, “has revealed that entry in the immediate future by other airlines is unlikely on any of those routes”. It attributes this to a number of reasons, including costs of entry, the Greek economic situation, or because potential market entrants see more profitable opportunities elsewhere. Aegean has not been profitable since its privatisation and acquisition by MIG in 2009, although its net loss narrowed to EUR8.6 million in 2012 from EUR37.6 million in 2011 and its EUR12.2 million loss in 1H2013 was narrower than the EUR21.6 million it lost in 1H2012. The European Commission asserts that: “A thorough analysis of Olympic’s business prospects has confirmed that the company is highly unlikely to become profitable in the foreseeable future under any business plan”. As a result, MIG was no longer prepared to support Olympic and the only realistic alternative to acquisition by Aegean would be its permanent closure. The Commission’s investigation has confirmed “that there is no other credible purchaser other than Aegean interested in acquiring Olympic” and that there has been no “credible” interest in acquiring its assets or brand. “Consequently, the most likely scenario is that absent the transaction Olympic’s assets would leave the market completely”, says the Commission. The EC approved the acquisition by invoking the so-called ‘failing firm defence’ scenario. The Commission’s investigation rightly focused on the domestic market, where Aegean and Olympic jointly control 90% of seats and LCC competitors have less than 3% of seats. At Athens, Aegean and Olympic have 99.6% of domestic seats between them (source: Innovata, week of 2-Sep-2013). By contrast, on international routes, their joint share is only 17%, virtually all of which is Aegean’s. LCCs’ year-to-date share on international routes is more than 35%, up from les than 32% in 2012 and less than 5% 10 years ago. So the Commission’s focus on domestic routes, where there were justifiable competition concerns, and its ignoring of international routes make sense. Or does it? Is a near-monopoly in the domestic market inevitable? In the domestic market, the Commission cannot be faulted for concluding that Olympic will disappear unless Aegean buys it, but is a near-monopoly situation inevitable with or without the merger? The Commission believes that there are no other credible buyers of Olympic and this may well be the case. However, is it not also possible that the market believed that the acquisition would be blocked? The proposed 2011 merger was blocked and the present acquisition was referred to a so-called Phase II investigation in Feb-2013 after the briefer Phase I investigation did not approve it. Why would a competitor airline step forward and trigger a bidding war for a loss-making airline if that competitor had good reason to believe that the deal would be blocked and that Olympic was then likely to collapse? Stepping into the vacuum created by a bankrupt carrier is a far more affordable, and less risky, approach to industry consolidation. The assets of the business can then be acquired more cheaply, or by-passed altogether. Ryanair’s moves in 2012 into Budapest and Barcelona following the demise of Malev and Spanair respectively are a good example of that phenomenon. Could there be new entrants on domestic routes? The Commission’s argument seems to rest on its assessment that new entrants into the domestic market were unlikely in the immediate future. While this is no doubt based on their very thorough investigation, again it is impossible to be certain about the response to the collapse of a significant market player by those currently operating in different, but related, markets. Who thought it likely that Ryanair was about to make such an aggressive entry into new routes from Budapest just before Malev’s collapse? It is true that Olympic’s business model as a regional airline operating 78 seat Bombardier Q400/Dash-8 turboprops is very different from that of the major European LCCs that compete with it and Aegean on the international markets. However, Aegean itself currently competes with Olympic on six domestic routes with 168 seat A320 aircraft (and some with 195 seat A321 aircraft). If an LCC were to enter any of these markets, it is very likely that it would offer fewer frequencies than currently offered by Olympic. However, there can be little doubt that these routes could support the A320 family or Boeing 737 aircraft typically operated by LCCs. 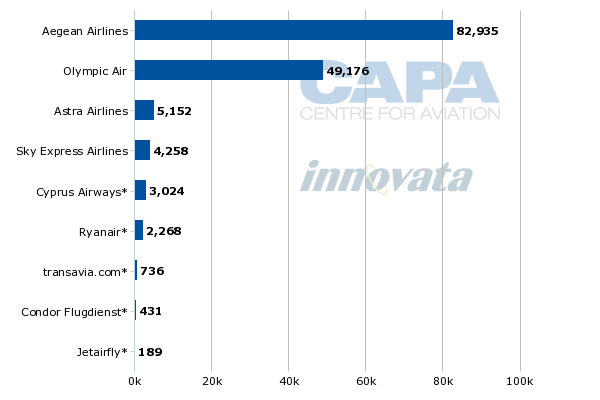 Previous CAPA analysis has shown that LCCs have a significant cost advantage to Aegean. If the acquisition of Olympic by Aegean had been blocked by the EU, and if Olympic had then disappeared, any subsequent entry by LCC competitors on the overlap routes would likely have proved damaging to Aegean. It should be grateful to the Commission for allowing the merger (although it is still possible that LCCs may enter in the future). On the international market, Olympic is a very minor player, operating to only five destinations in Eastern/Central Europe. Only 11% of its seats are on international routes (source: Innovata, week of 14-Oct-2013) and its share of international seats to/from Greece is only 1%. Aegean is number one in the international market, with 16% of seats, but it does not overlap with Olympic on any routes. LCCs are significant competitors on international routes. Clearly, the acquisition of Olympic by Aegean does not directly raise competition concerns in this regard. Aegean chairman Theodore Vassilakis agrees. After receiving the Commission’s approval for the merger, he said: “…the synergies will allow us to support an improved growth rate for our international network, both from Athens and the periphery…”. This impact on international markets is neither sufficiently defined nor significant to warrant intervention by the competition authorities. Nevertheless, it is an important element of the motivation behind the merger. ‘Failing firm defence’, but why was new entry not considered? As far as we are aware, this is the first example of the European Commission using the failing firm defence scenario to approve a merger that clearly leads to a monopolistic situation. It is also a rare example of approval for a combination that has previously been blocked. It is not clear why the possible entry of new competitors was not considered to be a possible scenario. This looks like an oversight on the part of the investigation. Approval of the merger is almost certainly good news for Aegean as it will strengthen its position in the Greek domestic market and give it a firmer platform from which to pursue international growth. Without an annual profit since 2009, the cost synergies and improved pricing power derived from the deal should help in its strive to restore profitability. Indeed, equity markets welcomed the deal: Aegean’s share price rose by 20% from 1-Oct-2013, the day before the EU decision was leaked, to 10-Oct-2013, the day after official confirmation was announced. Nevertheless, it may have been even better news for Aegean if Olympic had collapsed, especially if the European Commission is right that new entrants on its domestic routes are unlikely. This would have allowed Aegean to step into Olympic’s routes and market share without having to pay EUR72 million for an airline that lost almost EUR130 million in the three full years it spent under MIG’s ownership.